When I think of Easter desserts, carrot cake is the first thing that comes to mind. I'm not really sure why it is considered the ubiquitous Easter cake, other than the fact that well, rabbits eat carrots? In any case, I really like carrot cake: it has a nice warmth from the cinnamon and nutmeg, and the carrots keep it sweet and moist. I saw Annie convert Cook's Illustrated's version of a carrot cake into cupcakes last fall, and I decided to do the same thing when I set out to make these. As far as difficulty goes, this is an incredibly easy recipe. Peeling the carrots is by far the most time consuming step, but from there it comes together very quickly. I also like that it is made in the food processor. What a fun new use for it! I used my favorite cream cheese frosting recipe (which, coincidentally, I also got from Annie), which I love using to pipe - so pretty! I took these to a friend's birthday party, and they were enjoyed by all! Adjust the oven rack to the middle position, and preheat to 350. Line 2 muffin pans with liners and set aside. In a food processor fitted with the shredding disk, shred the carrots (you should have about 3 cups). Add the carrots to the bowl with the dry ingredients and set aside. Wipe out the food processor and fit with a metal blade. Process both sugars with the eggs until frothy, about 20 seconds. Keep the machine running, and pour the oil through the feed tube. Continue processing until the mixture is light in color and well emulsified, about 20 seconds longer. Scrape the mixture into a large bowl, and stir in the dry ingredients and carrots. Fold in until there is no longer any flour visible. Fill each cupcake liner 3/4 full, and bake for 18-24 minutes, or until a toothpick inserted in the center comes out clean. Cool in pans 5 minutes, then transfer to a wire rack to cool completely. Frost, and serve. Yum. I keep on meaning to make carrot cake. 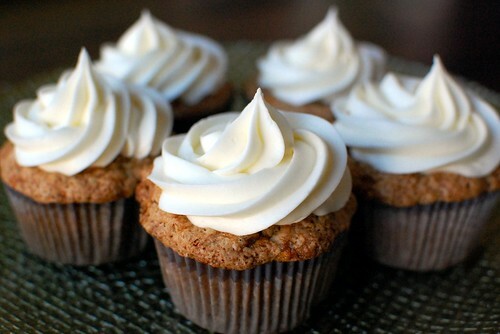 I love the way you've piped the frosting - it looks really cute. Hi, this is my 1st time here, you have a lovely blog and you have good collection of posts, I will come back to check what you baking/cooking the next. These look so wonderful! What piping tip did you use for the frosting? I really like the shape it creates. Also, what color are the cupcake papers exactly?? Black and Brown? I really like them too! Beautiful cupcakes! I love carrot cake! 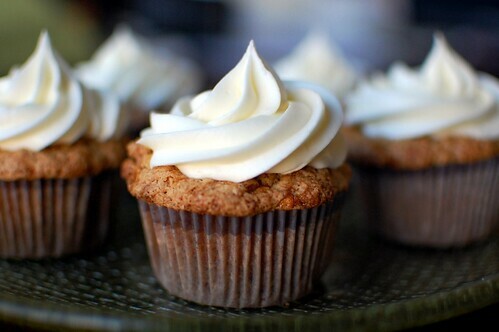 Fantastic carrot cupcakes! I've included them in our Party Cupcake Ideas feature! Carrot is a rich source of nutrients. Carrot contains lots of vitamins which are good for skin, nails, stomach and eyes.